"Two genies in a bottle, up in the starry sky!" If you've heard this song, than you probably know about the twin genies, Shimmer and Shine. When your little girl is in this Deluxe Shine Costume, she'll have a magical time playing as her favorite genie-in-training, or as part of a wish granting duet! This magical pair of genies love helping out, and even though the wishes they grant sometimes cause more problems than they solve, they still do whatever they can to set things right. Shine likes to have fun just like her sister, Shimmer, but as the more courageous of the two, she is more interested in seeking out excitement rather than finding the fun in whatever she's doing. If she happens to find some snacks along the way, that's even better because she is always in the mood for some treats! And, in case you hadn't heard, Shine loooves animals, and her pet tiger, Nahal, always joins them on their adventures. So, how can your little genie really shine like Shine? Well, for starters, this costume is made of shiny material, and the poofy pants are covered in sequins, for even more glimmer. The jumpsuit, headpiece, vest, and sash are all bright blue in color, as blue happens to be Shine's favorite color. 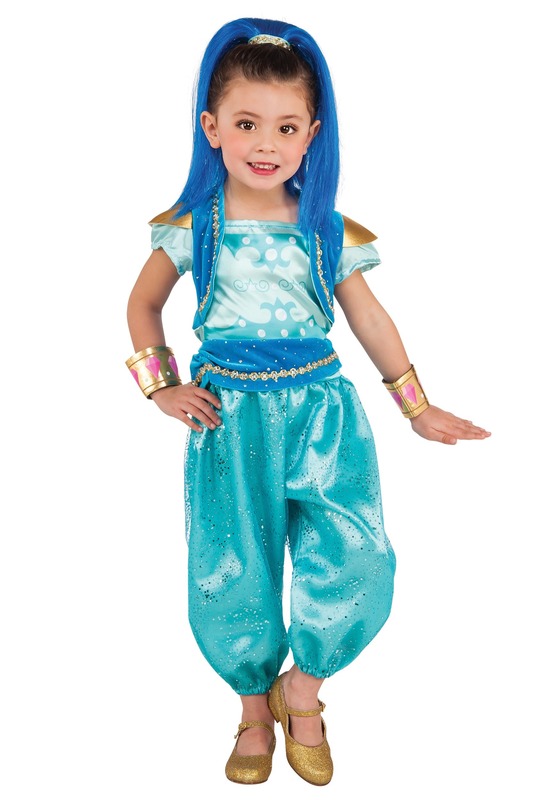 Your little one will find plenty of excitement playing genie in this outfit, and if she finds a friend to dress up as Shimmer, they'll be having a blast before you can say "Boom, Zahramay!"